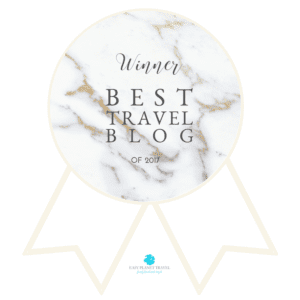 Here are my 7 Tips for visiting Machu Picchu, which was named the best-rated landmark in the world by TripAdvisor’s Traveler’s Choice 2016. The iconic citadel attracts visitors from all over the world, and it is very hard to find someone who doesn’t want to visit it. 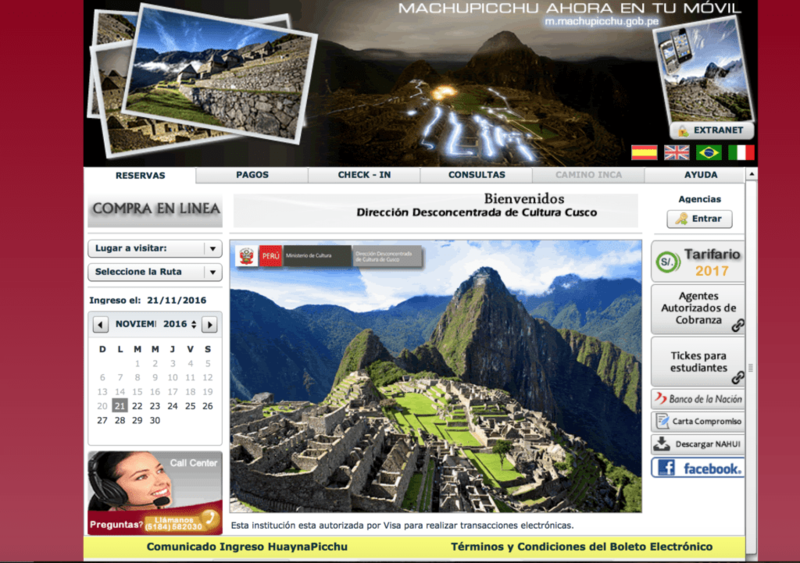 To have an idea, in 2013 over 1,200,000 people visited Machu Picchu. 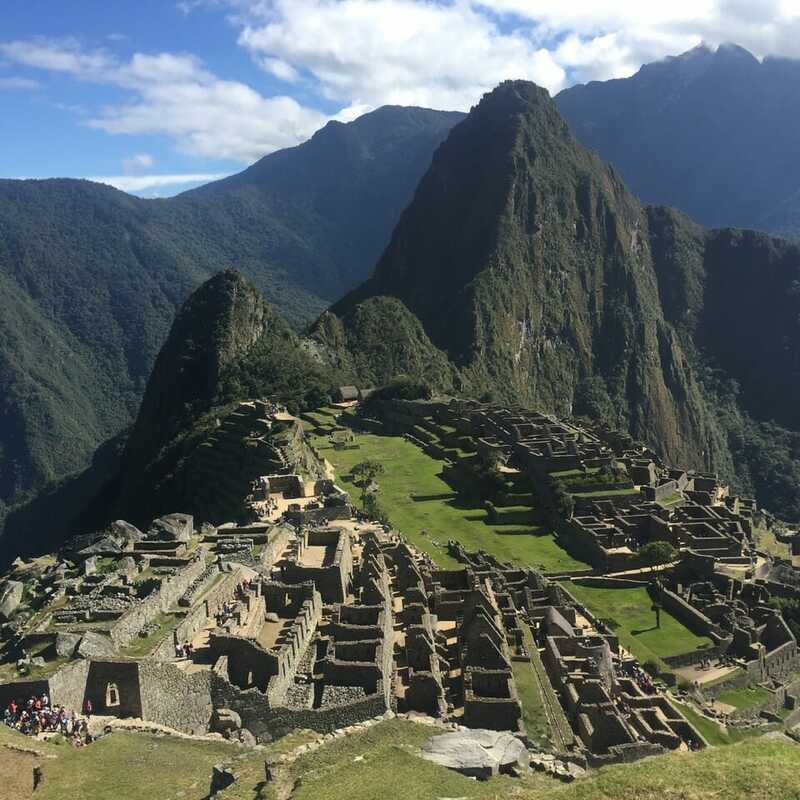 So, based on my visit and many other posts that I’ve read, I prepared this post with 7 tips to visit Machu Picchu to help you get the most out of your visit to this UNESCO World Heritage Site, and one of the New Seven Wonders of the World. Watch video: Machu Picchu: more than a journey through the Inca Civilization. You don’t want to travel all the way to Machu Picchu and when you get there it is raining, or even worse, the citadel is covered with fog and slippery so you can’t take good pictures, do you? So, from May to September is the dry season and from November to March the rainy one. 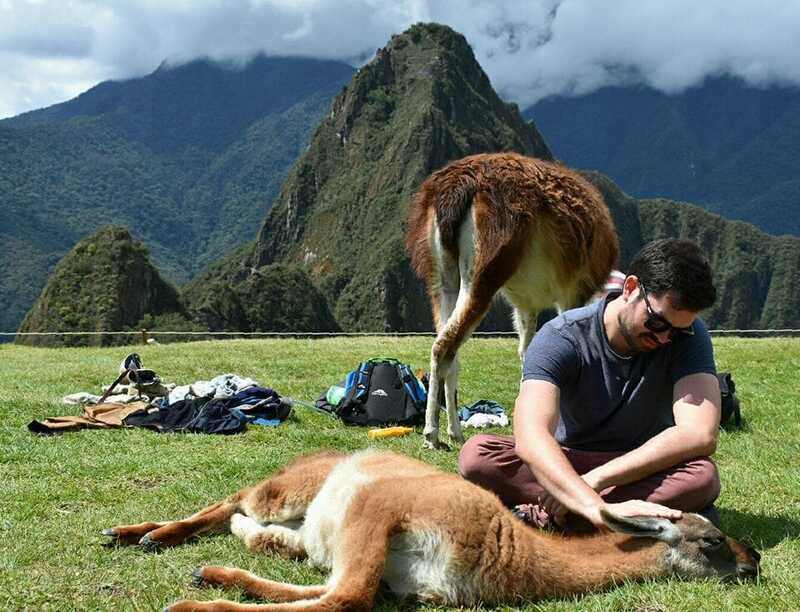 Considering that July and August are the busiest months, the best time to visit Machu Picchu is during the shoulder seasons (May/June and September/October). 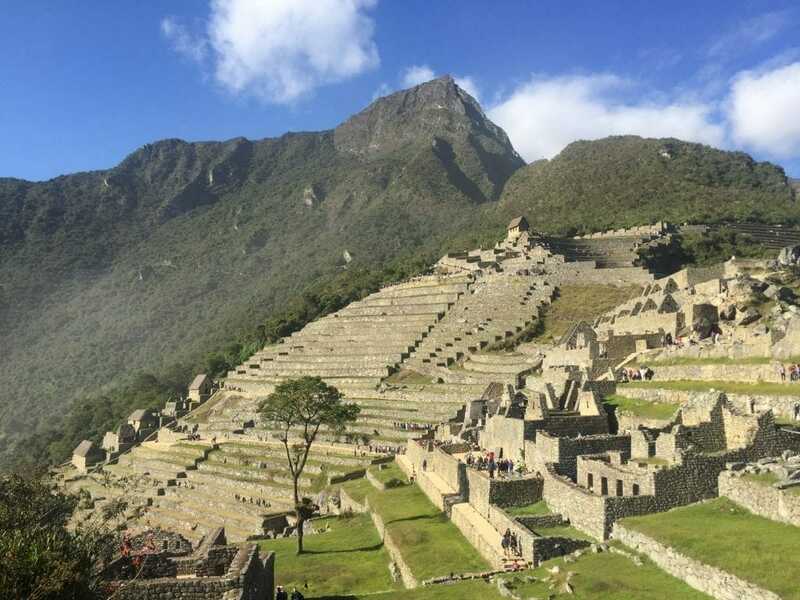 I can’t guarantee that it’s not going to rain, but if you want to get that National Geographic picture and ultimately enjoy your time there, please follow the first of my seven tips to visit Machu Picchu and go during the right months. Machu Picchu with Huayna Picchu on the back. Only 2500 visitors are allowed to visit Machu Picchu every day, because of an agreement between UNESCO and the Peruvian Government. So, I urge you to buy your ticket in advance to visit the citadel because tickets cannot be purchase there. How far in advance do you should book your ticket? 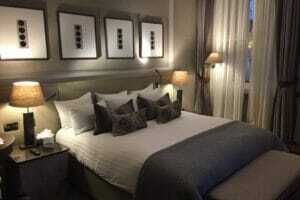 Book tickets as soon as you make your travel arrangements, or even before that. When I was in Aguas Calientes (Machu Picchu Pueblo), I saw some people buying tickets the day before visiting Machu Picchu. This is so risky!! Do not do it! Do not take the risk of flying to Peru, going to Cusco, and then taking the 3h train to Aguas Calientes, or taking the 7h van plus 2h walk on the train tracks as I did (Machu Picchu on a budget), getting there and finding out that there aren’t tickets available. 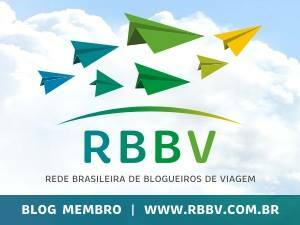 Plan your trip in advance and get your tickets online on the Peruvian government site, or contact any agency listed there, and send the money using Paypal, Western Union or Money Gram. 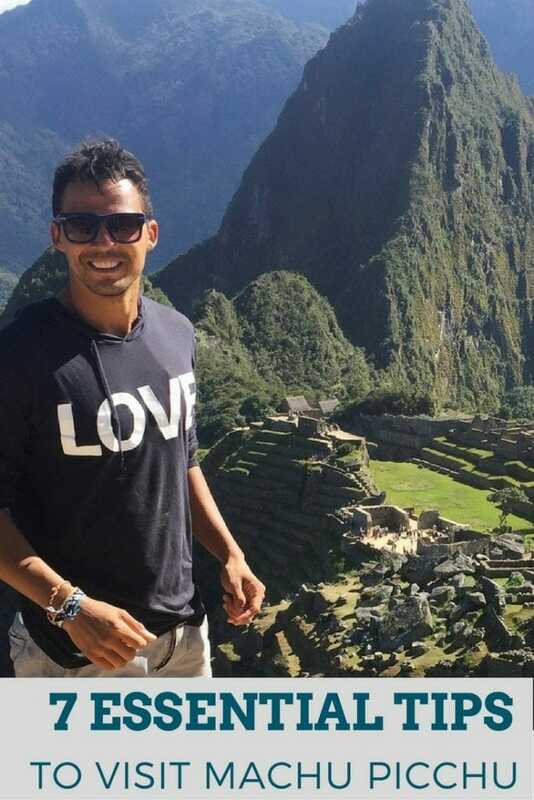 This is the second, and probably the most important of the seven tips for visiting Machu Picchu! 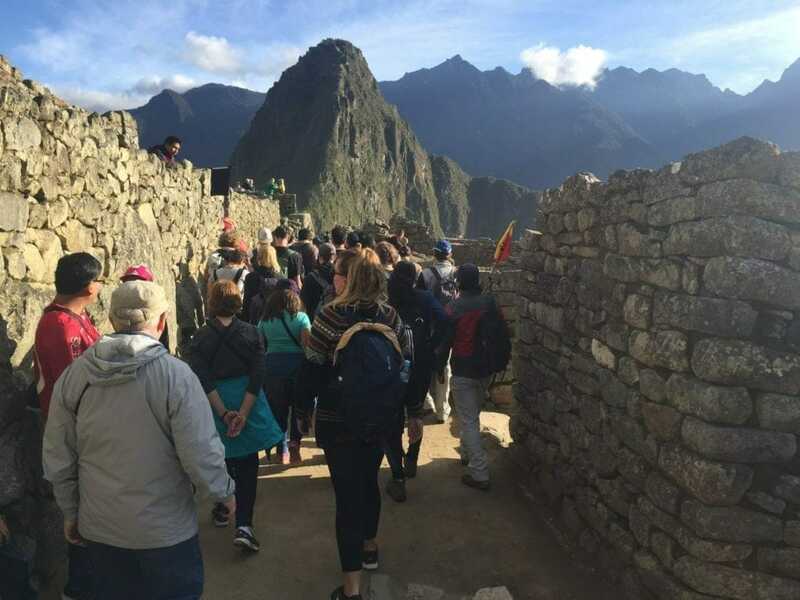 Even though the limit of daily visitors of Machu Picchu is 2500, since 2011 this number has been far exceeded, and in 2015 over 1.2 million people visited the citadel. 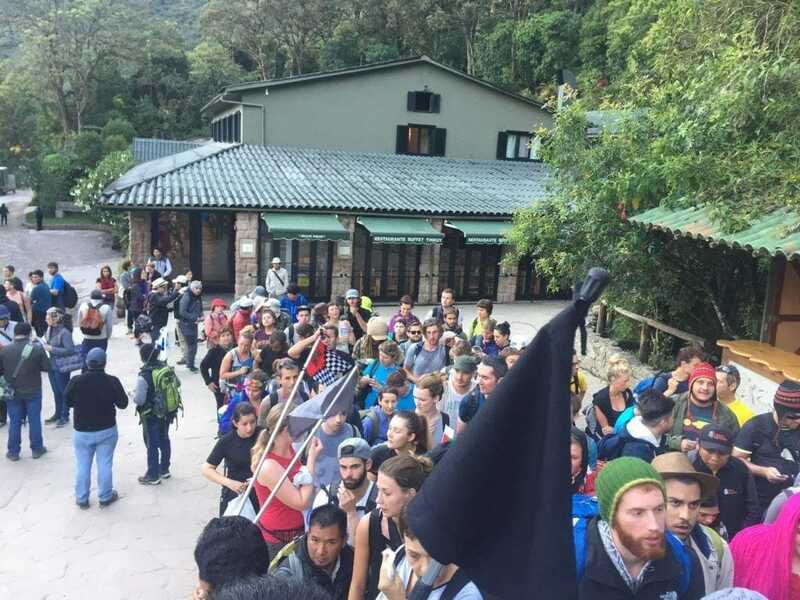 Most of the visitors arrive in Aguas Calientes (the closest city to Machu Picchu) by train from Cusco, and the first train arrives around 10:00. It means that after 10:30 the citadel is going to be crowded. So, my third of the seven tips for visiting Machu Picchu is to sleep in Aguas Calientes the night before, and get to the citadel early in the morning. The park is opening daily from 6:00 AM to 5:00 PM. How about getting there to see the sunrise as I did? I arrived at 6:30am and there were so many people already in the line at the entrance. However, seeing the sunrise behind the colossal mountains was magical and unforgettable. Now that you have planned your trip in the right month, bought your tickets in advance, and arrived early in the morning before the massive groups of tourists, your guide will take you on a two hour tour around the citadel. You didn’t hire a guide? Now you’re going to walk among the ruins, take tons of pictures and read a book about Machu Picchu’s history??? There aren’t information boards explaining what you’re looking at. So, please, if you want to get the most out of your visit, you must hire a guide. Guides are so inexpensive in Machu Picchu, and you can find one for as low as 20 soles (US$6). Not hiring a guide is a big mistake. They will provide all the information that you need to know about the lost city of the Incas, and even more. My fourth tip for visiting Machu Picchu is to hire a guide, and you can do that in Cusco, Aguas Calientes, and even at the park’s entrance. * With the new rule, hiring a guide is now mandatory. After the two hour guided tour, you will have some free time to yourself. But what most people do is take tons of pictures and leave. Very few visitors stay there in the afternoon, or until the park closes. Actually the peak time is between 11:00 and 3:00, so before and after this is the perfect time to walk around the alleys once again without having to wait for people climbing the steps and moving into your pictures. Take your time during your visit, rest on one of the lawns, and enjoy the breathtaking vistas as much as you can, because you may not come back. Machu Picchu is one of those mythical and mesmerizing places that you just don’t want to leave. And remember that it’s not just a landmark but also a sacred place. What about petting an alpaca? Photo Credit Fabio Henrique. There are several optional short hikes that you can do at Machu Picchu. The Sun Gate, 3h round trip, and the Inca Bridge, 1h round trip, are free hikes and very easy to do. But if you want some adventures and a privileged view, you should definitely hike Huyana Picchu or Machu Picchu Mountain (Montaña). Huyana Picchu, a mountain facing the citadel and the one we see in every picture of Machu Picchu, is not as high and easier, therefore the most popular. The peak of Huayna Picchu is about 2,720 m (8,920 ft) above sea level, and 360 m (1,180 ft) higher than Machu Picchu. The hike takes in general 2h, and there are some slippery steps and steel-cables to provide support during the climb. 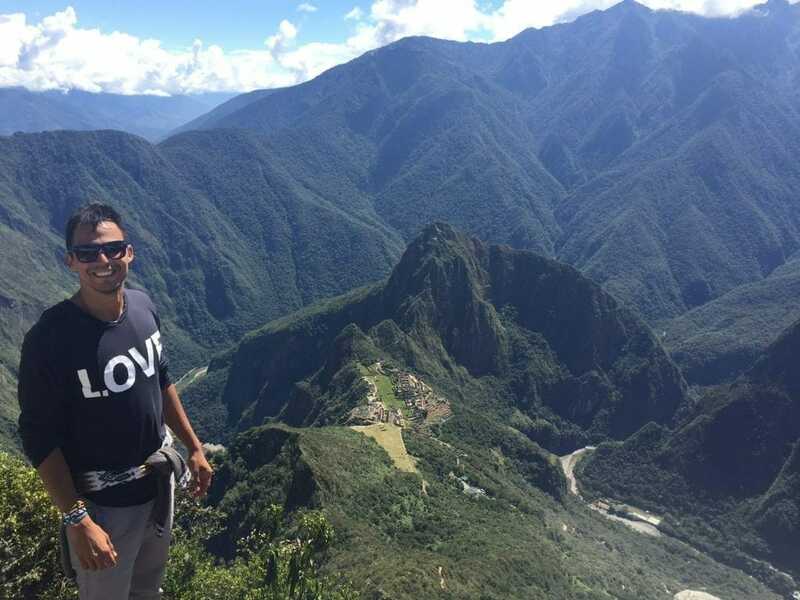 Montaña, a huge mountain across Huyana Picchu, is higher and more difficult, but the views are actually better. The altitude of the summit is 3,082 m (10,11 feet) above sea level, and 652 m (2,139 feet) above Machu Picchu. The terrain is made up of stone path steps (Inca Trail style), and the hike takes about 3h. Only 400 people per day are allowed to climb those mountains, and tickets have to be purchased in advance. The citadel with Machu Picchu Mountain in the background. I hiked Machu Picchu Mountain and it was the most difficult hike I’ve done so far. There isn’t a single flat part, only ascents, and the high altitude makes everything harder. But the view is absolutely stunning and it’s totally worthwhile. From the top of Montaña. 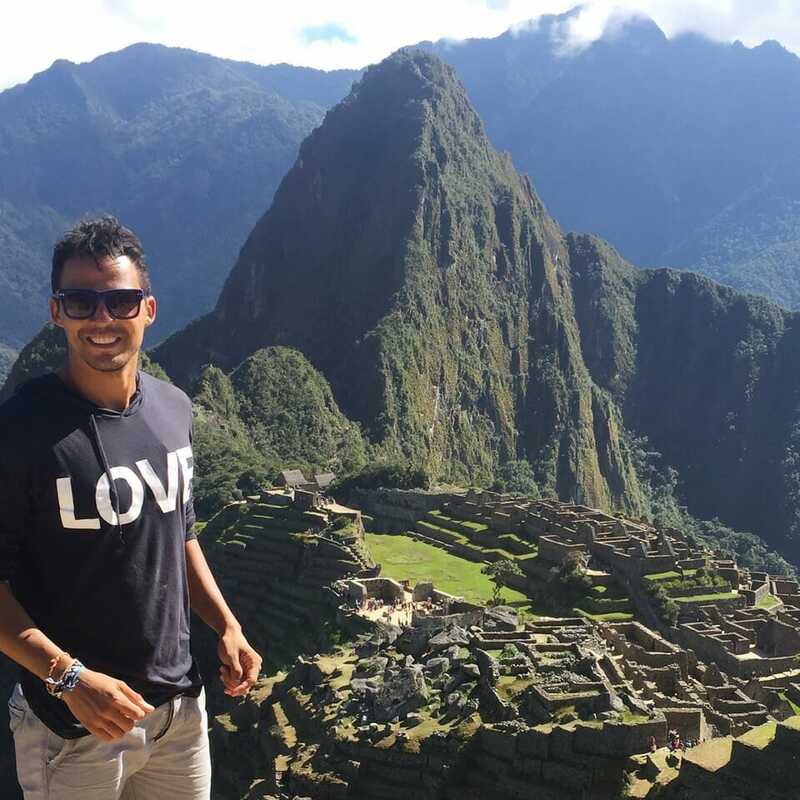 Be adventurous and follow the sixth of my seven tips to visit Machu Picchu! When visiting the Inca citadel you need to present a valid travel document with your ticket, so don’t forget to bring your passport with you. 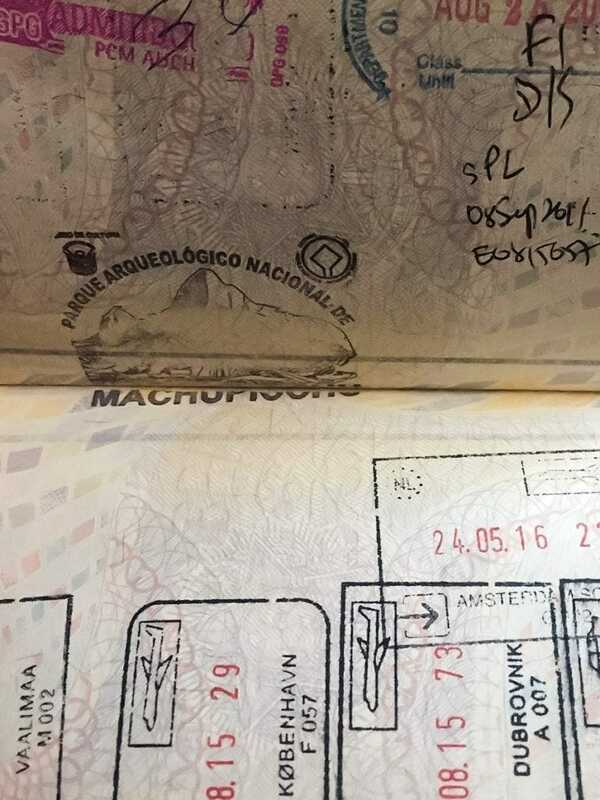 Once you’ve followed all these tips to visiting Machu Picchu and it’s about time to leave the park, don’t forget to stamp your passport at the booth located on the right side just before you pass the exit gate. Only very few tourists attractions in the world have its own stamp. So don’t miss the opportunity to get yours. I can confess that I almost forgot mine, and luckily I remembered exactly in front of the gate. Now I’m proudly boasting my Machu Picchu stamp. Machu Picchu is a once-in-a-lifetime experience, a journey through the Inca Civilization and a chance to visit an early history of mankind. ∗ If you’re planning a trip to Peru, you should read my post How to plan a trip to Peru. P.S. : Don’t forget to take the yellow vaccine at last 10 days prior to your arrival, and the international certificate of vaccination for yellow fever.